“How Did Early Humans Organize? In “How Did We Become Humans?”, we explained how human beings evolved from earlier primates (ape-like animals). We explained that this happened through the process of “survival of the fittest”. This means that those animals that were most fit – most able to survive, maybe because they could run faster, or were stronger, or had a more usable hand – tended to live longer and, therefore, had more babies. Those babies tended to inherit this trait and passed it on. In the case of our ancestors, what came first was walking upright and the freeing up of the arms and hand, which led to tool making and… the larger brain (intelligence) to make greater use of these abilities. But all of that is only the very, very beginning of the story. All animals have ways of organizing, of working together. They organize to get food and to protect themselves. Many herbivores (animals that eat plants, including fruit, nuts, etc.) band together for protection. In a herd of antelope, for example, one of the herd may spot a predator – a lion, for example – before all the rest. That one goes on “alert”, all the rest notice almost instantly, and they prepare to flee. The lions on the other hand, hunt in a group (called a “pride” of lions); they work together to bring their prey down. Because even the earliest human beings had much more complex ways of making a living they also had much more complicated systems of communicating – language, in other words. And they also had more complicated ways of organizing in general, including mating patterns – producing offspring. The Neolithic Revolution in Egypt. People went from hunting and gathering their food to raising crops and animals. 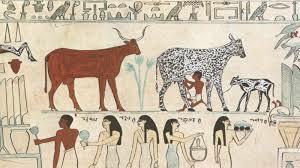 You see here a picture painted by early Egyptians of people tending their cattle, for example. ate, how we related to each other — it was all very different from today. There’s an important lesson in that: Many people today say that our present behavior is “natural”, it’s what we’re born with. But the fact that behaviors were so very different for over 90% of the history of our species proves that that’s not true. As we read about human society’s development, it’s important to keep that in mind. Read the entire piece…How Did Early People Organize?